Have you ever had a supplier send you an invoice based on a payment schedule and a statement of work, but had no way of knowing if that work was ever completed - or if the deliverables were to the satisfaction of your business unit? If your statement of work didn’t have clearly defined deliverables or an acceptance process for those deliverables, then the chances are there isn’t much you could about it – except pay the invoice and hope they did a good job. But it should never be that way with professional services. Any time you negotiate a statement of work with a professional services provider - whether it’s for a fixed-cost engagement or time and materials - you should always have clearly defined deliverables with milestones, an acceptance process for each deliverable, and payment terms tied to the acceptance of those deliverables. Have you ever had a supplier ask for annual fee increases during negotiations? It's a typical demand from suppliers. And most organizations simply meet them half-way by agreeing to a cap on annual increases. But in many cases, allowing annual increases is like allowing the supplier to rip you off. Ever get stuck in a contract negotiation because you had to consult legal? It’s important for procurement professionals to refer to their in-house counsel when the legalities get complicated. After all, they are the ones with law degrees. But having a basic understanding of the common legal terms you'll find in contracts can be a key bargaining chip. The good news is you don’t need a law degree to be able to understand some of these terms. And when you become the one who knows their way around a contract, you'll become the go-to person at the negotiating table. That’s why this week we’re kicking off a new video series that will go through some of the more confusing clauses you'll find in many contracts. For the past few weeks, we've been talking about how a good contract management process can help generate cost savings from technology agreements. When you have better visibility into your technology agreements, you're less likely to fail an audit or get hit with a software compliance penalty. And when renewal time comes around, you'll be able to negotiate with suppliers from a position of strength. All of this results in cost savings. But there's one specific area that can generate almost guaranteed and immediate cost savings — mainframe software licenses. Technology vendors who supply mainframes like to scare clients into believing they're the only ones smart enough to manage the software licenses. Not in my experience. We once helped a client save $1 million annually in management fees they were paying a mainframe data centre supplier. Due diligence and post-acquisition review can be chaotic. Your team could be facing hundreds - or thousands - of contracts that they need to go through in just a couple of weeks. With so much to do in so little time, it's easy to miss critical issues in some of the contracts. But even one of those issues could end up costing your business millions of dollars in unexpected expenses down the line. How to Avoid Negotiation "Dead Ends"
Have you ever gotten stuck in a negotiation? Sometimes, after weeks or months of ongoing negotiations, you can reach a point where neither side is willing to concede on a term. And the negotiation comes to a crashing halt. But if the deal dies on the table, both sides lose. Elite negotiators know how to push for their terms without hitting a "dead end" and jeopardizing the entire deal. Have you ever lost your cool in a heated negotiation? It can be easy to let the other side get under your skin when emotions run high. Sometimes, all it takes is one underhanded comment to send you over the moon. But letting your emotions get the best of you in a negotiation is what amateurs do. Elite negotiators know how to control not only their own emotions, but the other side's as well. In this video, we'll discuss how your counterpart might try to get you to lose your cool and how you should respond to the provocation. 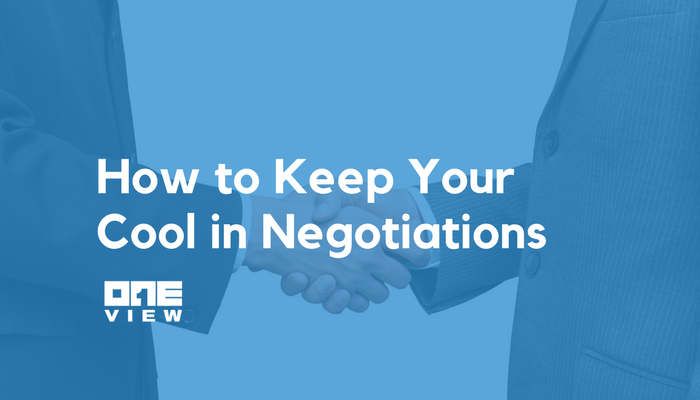 Several years ago, while still cutting my teeth as a contracts negotiator, a good friend of mine encouraged me to take a few courses from Harvard’s Program on Negotiations. One of the courses was “Dealing with Emotions in Negotiations”, and it touched on an issue that every negotiator will inevitably have to deal with, likely more than once in their career: having someone disrespect your authority in a negotiation. As professionals, we carry certain corporate designations earned by way of merit and experience. I’ve been an analyst, specialist, manager, and director. Each of those titles came with a set of responsibilities and a level of authority. Some could view the responsibilities as a burden, but everyone has a strong emotional attachment to the authority they feel they’ve earned. And when another person steps on that authority or tries to take some of it away, the response is equally emotional and often irrational. A study was conducted on the behavior of drivers in mall parking lots, specifically with regards to pulling in and out of parking spaces. The study found that drivers were more patient waiting for a car to pull out of a space if the car they were waiting for was more expensive than what they were driving. Conversely, drivers would display a greater sense of urgency (and in some cases, real anxiety) if there was an expensive car waiting for them to pull out. The car we drive, the suit we wear, our watch and our shoes all reflect our perceived level of authority with regards to those things. As negotiators, we also have a perceived sense of authority and we’re constantly trying to assert it over our counterparts on the other side of the table. And when we feel that our authority has been compromised, by way of a belittling remark or condescending gesture, it’s our response to the affront that often sets the table for the rest of the negotiation. In the Harvard course, we heard the story of a former student who had to deal with a similar situation. As a young, up-and-coming lawyer at a top law firm, she was given the task of representing a client’s management team in a critical negotiation with their Labour Union. The Union had hired one of the top Labour lawyers in the country whose reputation as a tough, no-nonsense negotiator was the stuff of legends. She scheduled a meeting at her office for 9 am on a Monday. She arrived at 8 am to find a very nervous looking receptionist, who informed her that her counterpart was already there and waiting in the conference room. She froze. Her authority had been assaulted. With a few words and a subtle gesture, he’d reduced her role to that of a clerk and tilted the playing field in his favor. What to do? Showing anger would portray her as emotional and inexperienced. Doing as she was told would be a sign of weakness. We’re human beings and we all have emotions. It’s how we handle our emotions that makes all the difference in negotiations. Two more to go! Next week we’ll look at Skill #6: Understanding BATNA. To make sure you don’t miss any of these negotiation lessons, head over to oneviewnow.com/negotiator and sign up — we’ll make sure all the videos are delivered straight to your inbox.